Civitas or The Institute for the Study of Civil Society is a London based right-wing think-tank which until 2000 was the Health and Welfare Unit of the Institute of Economic Affairs. In a March 2009 presentation Tim Montgomerie and Matthew Elliott described Civitas as part of the infrastructure of the conservative movement in Britain. The Institute of Economic Affairs was set up in the mid-1950s by Antony Fisher, an Old Etonian who made his fortune by pioneering US battery farming techniques in the UK. Fisher had joined the Mont Pelerin Society, a group of right-wing intellectuals who were highly critical of the post-war consensus around government intervention in the economy. He was advised by one of the Society’s leading thinkers, Friedrich Hayek, that rather than going into politics as he planned, he should spread neoliberal ideas by targeting intellectual opinion. Fisher therefore founded IEA and recruited the Cambridge-trained economist Ralph Harris as director, and Arthur Seldon as research director. Through its promotion of free market theorists like Milton Friedman the IEA provided an intellectual rationale for business friendly political and economic reforms introduced by the Thatcher government in the UK. Some Matherites [supporters of IEA’s director Graham Mather in an internal feud] claim the head of the Health and Welfare Unit, Dr David Green, might be raising money to split the unit away from the IEA with the help of Michael Novak, the American free marketeer who wrote The Spirit of Democratic Capitalism and who visited the unit this summer. Historically there had been a de facto division between the neoliberal think tanks which concentrated on neoliberal reform and the 'pro-family' movement - sometimes called the 'moral right'. As late as 1993 Martin Durham was arguing that ‘despite a recent increase in interest in family issues on the part of New right think-tanks, the “pro-family” movement continues to be organizationally independent of the New Right and distinct in its political priorities’. However, the rise of neoconservative ideas and the perceived need to fill the moral void left by neoliberalism seems to have brought the two elements of conservative politics together. One key writer was Patricia Morgan who ‘had been thanked by Lord Joseph for her help with his 1990 pamphlet’ for the Centre for Policy Studies. Thatcherism had placed ‘inadequate emphasis on the “civic virtues”, such as self-sacrifice, duty, solidarity and service of others,’ Green wrote, ‘The challenge we face today is to identify a sense of community or solidarity that is compatible with freedom.’  In other words it was necessary to develop institutions which could create a sense of moral and social solidarity that would not threaten private property or involve any expansion of the public sector. He therefore advocated the establishment of ‘voluntary associations’ modelled on the Friendly Societies of the 18th and 19th century. The table below displays information on the current and former directors of Civitas Ltd as registered with Companies House on 19 August 2010. Nominee directors are excluded. The nine then current directors (i.e. those where no resignation date is provided) are displayed first, followed by the company’s former directors. The earliest directors were David Green and Robert Whelan who served from the date of Civitas’s incorporation in June 2000. Six further board members were appointed in February 2001. Civitas set up the Centre for Social Cohesion in 2007, with funding of £274,669.The Centre's director is Douglas Murray, author of Neoconservatism: Why we need it. Anthony Browne highlighted Britain's Muslim community in his November 2002 Civitas pamphlet, Do We Need Mass Immigration?. As I write this, the UK is heading for war with Iraq, and even moderate Muslim leaders are warning the government of the impact on social relations with Britain’s two million strong Muslim community if Britain does attack another Muslim country (the less moderate leaders are warning that it will bring suicide bombing to Britain). Whatever the merits or demerits of war on Iraq, it is hardly a national strength to have a large minority with such divided loyalties during war. Civitas published The ‘West’, Islam and Islamism: Is ideological Islam compatible with liberal democracy? by Caroline Cox and John Marks in June 2003. The pamphlet's methodology was based on a distinction between Western societies on the one hand and 'ideological societies' on the other, a category which lumps together fascism, communism and Islamism. The propaganda battles of the Cold War, as understood through the work of figures such as neoconservative propaganda theorist Roy Godson and through Cox and Marks' own earlier writing, were cited as a precedent for the struggle with Islamism. it was the long ideological battles of the Cold War and the massive efforts by Marxists to subvert, and thus to subdue, Western societies from within that was most difficult for the citizens of these societies to understand and thus effectively to resist. Similar tactics were attributed to Islamists by Cox and Marks, but the possibility they might be used by Western societies was not considered. The tactics used in the current Islamist attack on Western societies resemble those used by Marxists in the last century —deceptions of many kinds together with the drip, feeder and multiplier effects which enhance the overall effectiveness of the committed ideologists even if their numbers are not large. Cox and Marks drew a distinction between moderate Muslims and ideological Islamists, but argued that "the distinction depends in practice on moderate Muslims being more forthright in distinguishing themselves from their ideological co-religionists." Patrick West's September 2005, Civitas book The Poverty of Multiculturalism criticised local councils for funding Islamic Awareness week while refusing to celebrate Christian festivals. This formed part of a wider critique of multiculturalism as cultural relativism. Cultural relativism, the philosophy that no culture is superior to another, is one of today’s widely accepted doctrines. In the twenty-first century, to assert the superiority of Western civilisation over any other culture elicits accusations of eurocentricism, arrogance or even racism. Civitas published A Nation of Immigrants? by David Conway in April 2007. The pamphlet argued that current levels of immigration are historically unprecedented and threaten the reproduction of Britain's political culture. Of late, there has been a growing realisation of the plausibility of some such claim in light of the discovery that all four suicide bombers of 7 July 2005 were British-born, second generation British Muslims who had grown up in Britain in highly segregated enclaves in which normal patterns of acculturation into mainstream British life have apparently become far harder to sustain. It is particularly in light of how quickly and recently many such enclaves have sprung up in Britain, and are continuing to grow apace, that all those who want to see Britain remain the stable, liberal, and tolerant country it has been for so long need to consider carefully how much truth or falsehood is contained in the claim hat Britain is and has always been a nation of immigrants. In February 2009, Civitas published Music, Chess and Other Sins, a pamphlet on Muslim schools by Denis MacEoin with the assistance of Dominic Whiteman. It argued that some Muslim schools "are threatening the social cohesion of Britain by promoting a fundamentalist version of Islam that encourages children to despise the British society in which they live and to confine themselves to enclaves.". In May 2009, the think-tank published the pamphlet Disunited Kingdom: How the Government's Community Cohesion Agenda Undermines British Identity and Nationhood , in which David Conway argued that "the main threats to community cohesion in Britain today come from mass immigration and the radicalisation of young British-born Muslims." The Government's estimate of a £2.5 billion gain to the Exchequer from immigration came under fire last week from right-wing think tank Civitas. It managed to calculate a marginally negative figure, lapped up as proof of mass scrounging by Britain's immigrants. But the figure was a result of subtracting the cost of running the immigration service from the taxes paid by immigrants. But is it right to count the cost of controlling immigration - essentially our political choice - against the workers' tax contribution? Plenty more arbitrary fiscal benefits, such as the fact that almost all immigrants come ready-schooled by their own state, could be added to counter the Civitas figures. Civitas advocates market-based reform of the NHS and for a bigger role for the private sector in providing NHS services. According to its website, the Civitas health unit was set up to 'facilitate informed and impartial debate among key stakeholders, patients, and the grassroots of the medical profession, in order to help build consensus on the future of health care in the UK. Civitas has been critical of the Conservative's proposed reforms of the health service put forward by Andrew Lansley. As well as criticizing Lanley's plan to hand NHS budgets to GPs, it slammed the Conservatives' plans to open up the NHS market, claiming 'the mechanism does not seem strong enough to drive the required improvements, unless a number of issues are addressed'. These included the inability of private firms to access private NHS pensions and 'ridiculously long' tendering times." , article in the Yorkshire Post, October 2010. This advoctaed "a new public consciousness" away from "the NHS as a culturally revered system of provision" and towards a competitive system with "new entrants with new ideas". BMA to shut out independent sector from NHS is misguided. A Civitas press release in February 2010 accused the British Medical Association, the doctors’ trade union, of 'politicising health care on cherry-picked evidence' in its bid to 'stop commercially run firms providing NHS care and end the market in the NHS, to patients.' Civitas responds by maintains that the quality of care is typically higher in Independent Sector Treatment Centres (ISTCs) than the NHS, and ISTCs cause NHS providers to drive performance in a way that would not happen without a competitive threat. It quotes a survey commissioned by the NHS Partners Network claiming 74% of those polled said the NHS needed 'to change to survive'; and 74% more closely align themselves with the statement 'I don't mind who owns or runs my NHS services so long as the quality is right' than 'Services on the NHS should only be conducted in a hospital or other medical facilities run and owned by the government'. The market can help the NHS, opinion piece by James Gubb in the Guardian, February 2010. This reiterates much of the above press release. Markets in health care: the theory behind the policy, Civitas report, December 2009. Authors James Gubb and Oliver Meller-Herbert argue that "Health care, due to its high upfront costs and centrality to humankind, is often considered ‘different’ and best left outside the domain of markets. But such blanket opposition ignores valid reasons for not dismissing the value markets." The report concludes that "The central challenge for policymakers in health care is best framed less as a choice between markets and the alternatives; more as to the optimum balance between them. James Gubb is the Director of the Health Unit at Civitas. Frank Furedi, 'Foreword' in 'The Meaning of Matrimony', Civitas, p.xiii -xiv, June 2013. Brendan O'Neill, 'A Liberal Critique of Gay Marriage' in 'The Meaning of Matrimony', Civitas, p.40-55, June 2013. Frank Furedi, 'Re‐reading C.P. Snow and His Elusive Search for Authority' in 'From Two Cultures To No Culture', p.61-76, Civitas, March 2009. Frank Furedi & Jennie Bristow, 'Licensed to Hug', Civitas, June 2008. 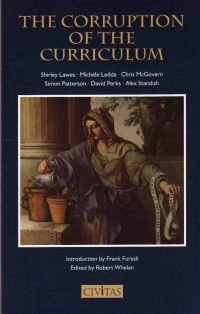 Frank Furedi, 'Introduction' in 'The Corruption of the Curriculum', Civitas, p.1-10, June 2007. Laura Brereton and Vilashiny Vasoodaven CIVITAS: Institute for the Study of Civil Society The impact of the NHS market February 2010. ↑ Tory! Tory! Tory!, broadcast Friday, 10 August from 2340 BST on BBC Four. See also Brian Wheeler, 'Tory! Tory! Tory! (Part one)', BBC News Online, 8 March 2006. ↑ Brian Wheeler, 'Tory! Tory! Tory! (Part one)', BBC News Online, 8 March 2006. ↑ Keith Joseph ‘’Rewards of Parenthood? Towards More Equitable Tax Treatment’’, Centre for Policy Studies, 1990. ↑ Patricia Morgan ‘’Farewell to the Family: Publc Policy and Family Breakdown in Britain and the USA’’, IEA Health and Welfare Unit, 1999, second ed. ↑ David G. Green, Reinventing Civil Society: The Rediscovery of Welfare Without Politics (Civitas, 1993) p.vii. ↑ Report and Financial Statements for the year ended 31 December 2007. ↑ CV, douglasmurray.co.uk, accessed 30 May 2009. ↑ Anthony Brown, Do We Need Mass Immigration?, Civitas, November 2002. ↑ Caroline Cox and John Marks, The ‘West’, Islam and Islamism: Is ideological Islam compatible with liberal democracy?, Civitas, accessed 31 May 2009. ↑ Caroline Cox and John Marks, The ‘West’, Islam and Islamism: Is ideological Islam compatible with liberal democracy?, Civitas, accessed 31 May 2009, p.9. ↑ Caroline Cox and John Marks, The ‘West’, Islam and Islamism: Is ideological Islam compatible with liberal democracy?, Civitas, accessed 31 May 2009, p.9 note 13. ↑ Caroline Cox and John Marks, The ‘West’, Islam and Islamism: Is ideological Islam compatible with liberal democracy?, Civitas, accessed 31 May 2009, pp.62-63. ↑ Caroline Cox and John Marks, The ‘West’, Islam and Islamism: Is ideological Islam compatible with liberal democracy?, Civitas, accessed 2 June 2009, pp.64. ↑ Caroline Cox and John Marks, The ‘West’, Islam and Islamism: Is ideological Islam compatible with liberal democracy?, Civitas, accessed 2 June 2009, p.74. ↑ Patrick West, The Poverty of Multiculturalism, Civitas, 25 September 2005, p.7. ↑ Patrick West, The Poverty of Multiculturalism, Civitas, 25 September 2005, p.1. ↑ A Nation of Immigrants? A Brief Demographic History of Britain, amazon.co.uk, accessed 31 May 2009. ↑ Unparalleled levels of immigration threaten Britain's cohesion as a nation, Civitas, 23 April 2007. ↑ Music, chess, Shakespeare, cricket and Harry Potter banned on fundamentalist Muslim schools' websites, Civitas, 20 February 2009. ↑ New Publications, Civitas, accessed 31 May 2009. ↑ Faisal Islam, Foreign workers: fact and fiction: Immigrants are vital to the British economy, whatever the tabloids say, says Faisal Islam, Observer, 11 April 2004, p.4. ↑ Civitas Health Unit. Health Unit Accessed 8 April 2010. ↑ Civitas Press. BMA to shut out independent sector from NHS is misguided Accessed 10 April 2010. This page was last modified on 28 April 2015, at 16:40.